On May 31st, women priests Christina Moreira of Spain and Janice Sevre-Duszynska from the U.S. met with a Vatican official at the Curia who promised to give Pope Francis our international women priest petition to lift our excommunications, punishments against our supporters and begin a dialogue with women priests. A major focus of their discussion was the history of women’s leadership in Early Christianity. 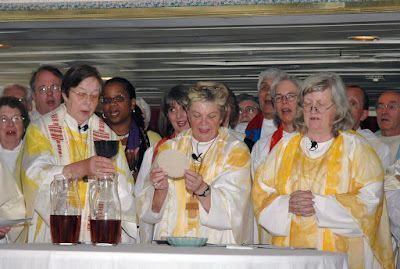 They were following up on Francis’s May 12 “yes” to women religious who asked for a commission to study women deacons. True to his word, Pope Francis has appointed a gender-balanced commission of six women and six men to begin the study. The gender balance and makeup of this Commission is a positive first step in the study of female deacons in the Roman Catholic Church. 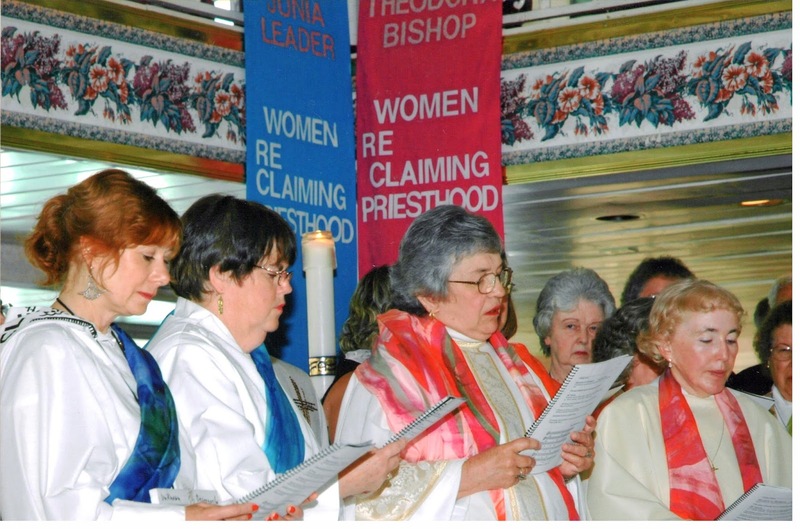 “It is our hope that this study could lead to a deeper appreciation of our earlier tradition of women deacons, priests and bishops in leadership roles in the church, and to the full equality of women as priests, bishops, and decision makers in a more inclusive, egalitarian church,” said Bridget Mary Meehan, a bishop in ARCWP. “The humanity of Christ overcomes the limitations of gender, and no church document argues an ontological distinction among humans except documents that address the question of ordination,” she continued. 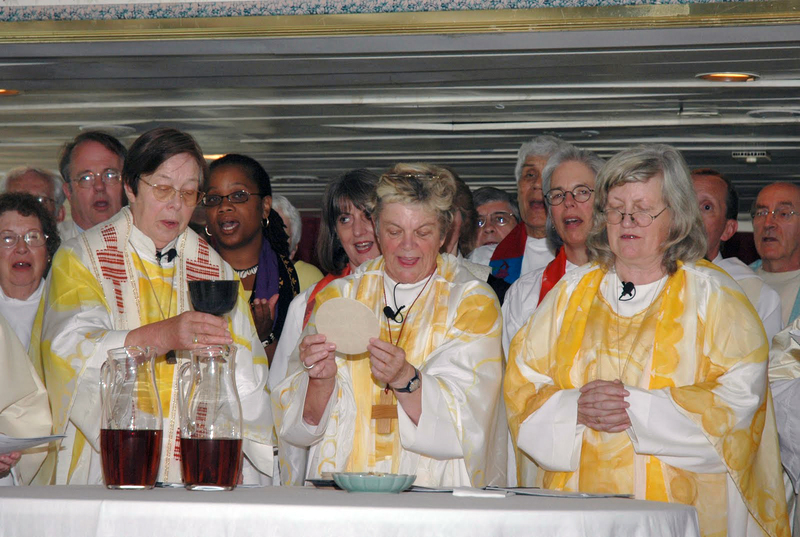 “This view is not likely to dampen growing worldwide enthusiasm for women deacons,” Zagano said. Once the Commission that Pope Francis called for delves into the scholarship, they will have a lot to share. 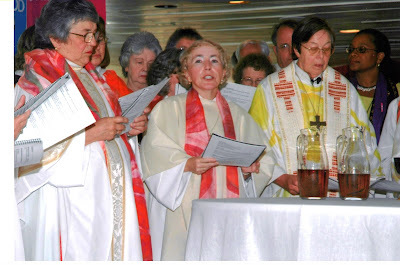 First, according to the 1976 Pontifical Biblical Commission's Report, the Vatican's own scholarship, there is nothing in scripture that supports a ban on women's ordination...."It does not seem that the New Testament by itself alone will permit us to settle in a clear way and once and for all the problem of the possible accession of women to the presbyterate." 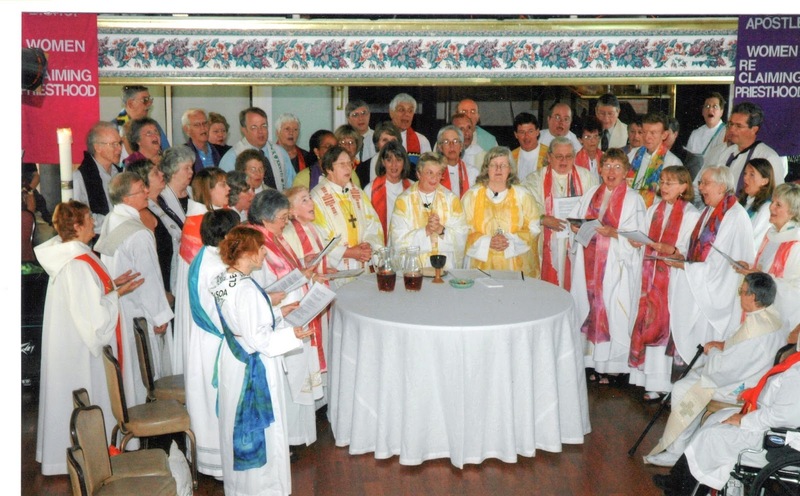 Second, the Ordination Rite that was used to ordain women deacons was identical for men and women. 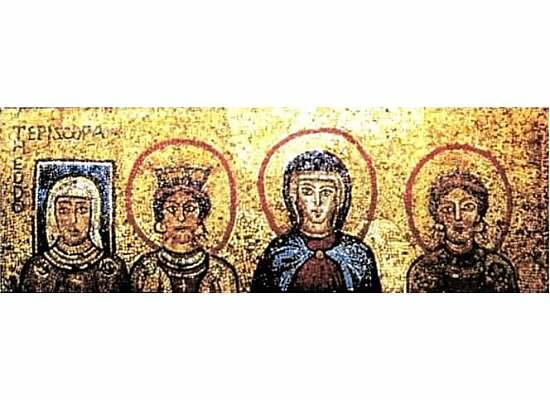 “Women deacons have been documented extensively for the first nine centuries especially in the Eastern part of the Church.” See Romans 16: Paul praises Deacon Phoebe and commends her leadership in the local church. "Women deacons assisted in the baptism of women which required anointing and immersion of the whole body. We know the exact ordination rites that were used. They involve the imposition of hands by the bishop, the invocation of the Holy Spirit to impart the diaconate and the imposition of the diaconate stole. Three, there is no evidence whatsoever, that ordination was required to preside at house church Eucharistic celebrations in early Christianity. Four, the history of ordination evolved and was understood differently in the first centuries of the church's history than in medieval and contemporary times. 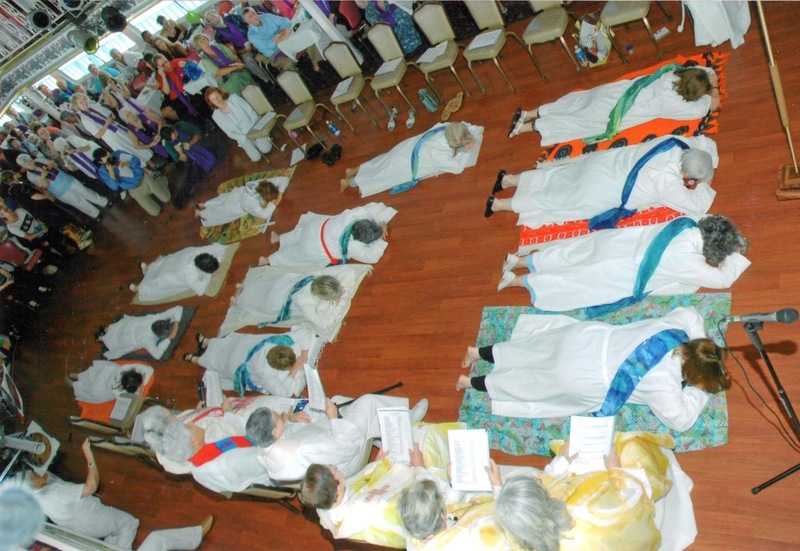 See Gary Macy, The Hidden History of Women's Ordination. So our advice to the Vatican Commission is check out the Pontifical Biblical Commission's report in 1976, visit the women priests website quoted above that cites years worth of scholarship by John Wijngaards, and read: No Women in Holy Order? 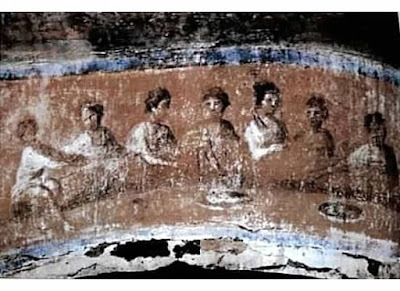 The Ancient Women Deacons by John Wingaards, Canterbury Press, 2002. No doubt the hard liners in the Vatican Curia are irritated by opening up this topic for study. They fear that it could lead to women priests! Our Roman Catholic Women Priests Movement has been ordaining women deacons, priests and bishops to serve in grassroots, inclusive faith communities, thus renewing the church on the margins, one renewed community at a time. Our international movement is calling on Pope Francis to dialogue with us, lift excommunications, and honor primacy of conscience. We are over 225 members on 5 continents, in 13 countries, serving 81 faith communities in 34 states in the United States. ..."The International Union of Superiors General (UISG) had asked the pontiff to create a commission to study women deacons in a meeting in May between him and some 900 of their members, each the head of a female religious order around the world. Sr. Carmen Sammut, the president of the group, told NCR Wednesday that she wanted to thank the pope on its behalf. "I understand this commission will provide the background information necessary for a discernment leading to a decision as to whether to open the diaconate to women in the Catholic church," she said. "I noticed with joy that together with the chair person, the commission is made up of 6 men and 6 women scholars, lay and religious, coming from various parts of the world," Sammut continued. "I see this as one of the ways Pope Francis renders concrete his constant desire that women play a more incisive role in the church." 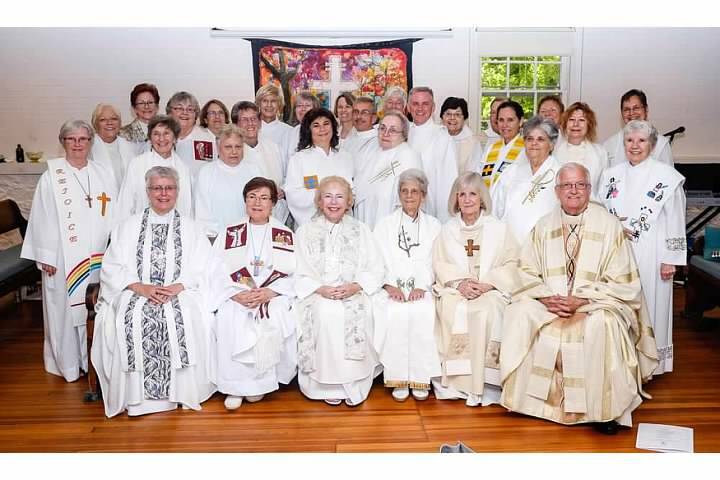 The formal name given to the group is "Study Commission on the Women’s Diaconate." The commission's members include experts in patristic theology, ecclesiology, and spirituality. During a question and answer session with the pontiff May 12, the UISG members told Francis that women had served as deacons in the early church and asked: "Why not construct an official commission that might study the question?" "I am in agreement," the pontiff replied. "I will speak to do something like this." 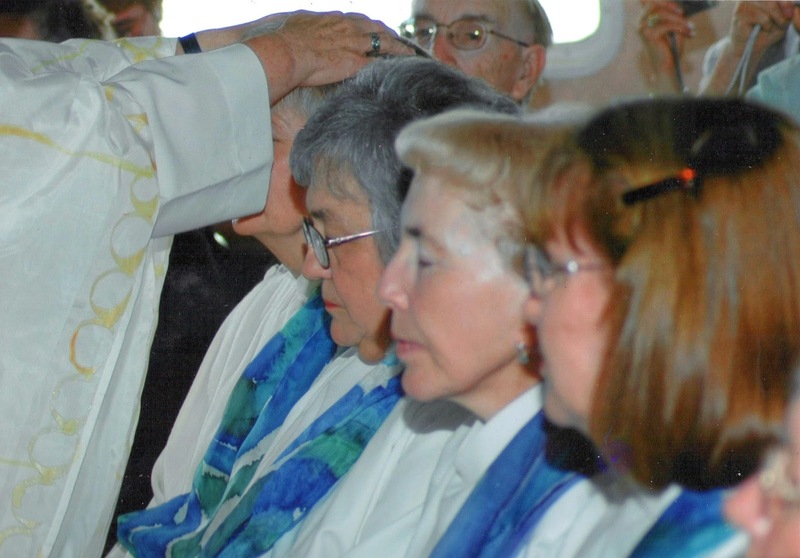 The UISG was created at the end of the Second Vatican Council and now has about 1,880 members representing approximately 500,000 global women religious. Sammut, who has led the group since 2013, is Maltese and is also the general superior of the Missionary Sisters of Our Lady of Africa. In an interview with Global Sisters Report following the May encounter with Francis, the UISG president earlier said she envisioned a future in which Catholic sisters could "go a step further" and be ordained as deacons. "Very often in different parts of the world we are doing most of the work that needs to be done," Sammut said then. "We are living very much in the periphery ... and priests are very rare in some of the places," she said. 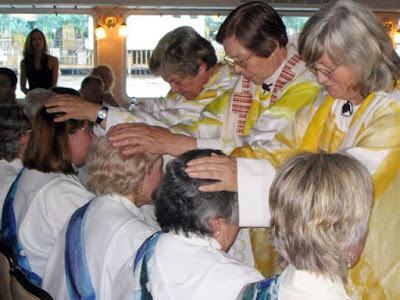 "There are services that we can give to the church, especially to the peripheral church where we are, which would be opened if we were women deacons." 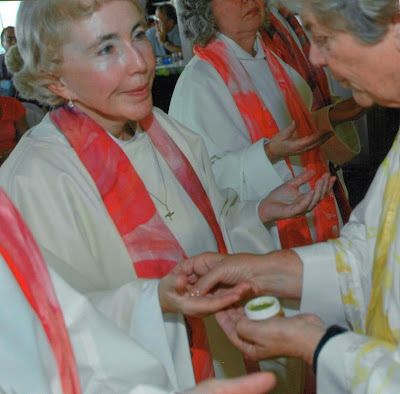 Phyllis Zagano, who was appointed to the Pope's Commission argues: "There is overwhelming historical evidence that women were ordained deacons by bishops intending to perform a sacrament. If women were sacramentally ordained deacons and the diaconate shares in the sacerdotal priesthood … then women have already shared in the sacerdotal priesthood,” Zagano wrote for America magazine in 2013. 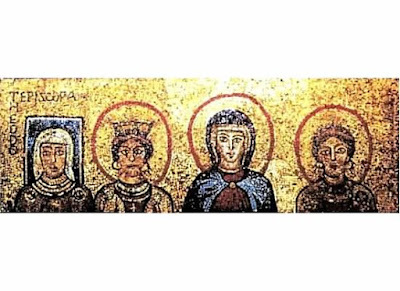 "Women deacons have been documented extensively for the first nine centuries in especially the Eastern part of the Church." See Romans 16: Paul praises Deacon Phoebe and commends her leadership in the local church. 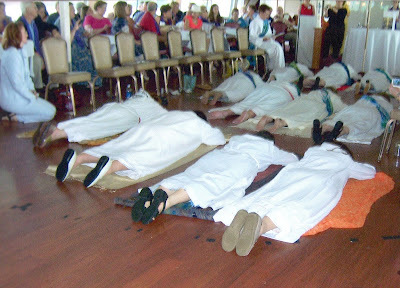 required anointing and immersion of the whole body. We know the exact ordination rites that were used. 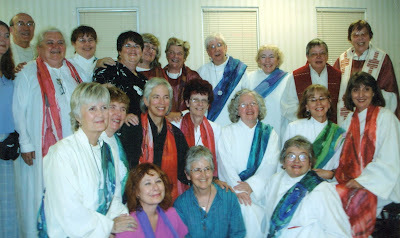 diaconate and the imposition of the diaconate stole. Read here one typical example of such a rite. So my advice to the Vatican Commission is check out the Pontifical Biblical Commission's report in 1976, visit the women priests website quoted above that cites years worth of scholarship by John Wijngaards, and read: No Women in Holy Order? The Ancient Women Deacons by John Wingaards, Canterbury Press, 2002. In addition, they should consults experts like Phyllis Zagano,German theologian Ida Raming and theologian and archaeologist Dorothy Irvin. Indeed, Pope Francis has opened a hornet's nest at the Vatican! No doubt the hard liners in the Vatican Curia are irritated by opening up this topic for study. They fear that it could lead to women priests! I believe that Pope Francis' Commission is a positive first step and could lead to the full equality of women as priests, bishops, and decision makers in a more inclusive, egalitarian church. Our Roman Catholic Women Priests Movement has been ordaining women deacons, priests and bishops to serve in grassroots, inclusive faith communities, thus renewing the church on the margins, one renewed community at a time. Our international movement is calling on Pope Francis to dialogue with us, lift excommunications, and honor primacy of conscience. We are 225 members on 5 continents, in 13 countries, serving 81 faith communities in 34 states in the United States. Today, Morag Liebert, RCWP, and I are leaving the Island of Iona and are making our way to Glasgow from Oban on the coast. What a blessed way to celebrate my 10th anniversary as a Roman Catholic Woman Priest. It is also a blessing to be with Morag who was the first woman priest I ordained after my consecration as bishop on April 19, 2009. Last evening we visited the Nunnery after liturgy at the Catholic Chapel. The Iona Nunnery was an Augustinian convent located on the island of Iona in the Inner Hebrides of Scotland. It was established sometime after the foundation of the nearby Benedictine monastery in 1203. Bethóc, daughter of Somerled, was first prioress. The ruins of the nunnery stand in a peaceful garden adjacent to Iona's main (and only) village, Baile Mor. They form the most complete remains of a medieval nunnery extant in Scotland. These are the last pictures (for now) from Iona. 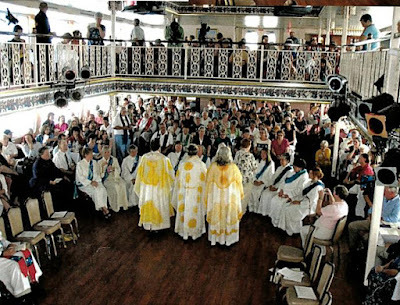 On July 31, 2006, twelve Roman Catholic women walked aboard the Majestic, an old triple-decked paddle wheel river boat in Pittsburgh, Pennsylvania, and into history. 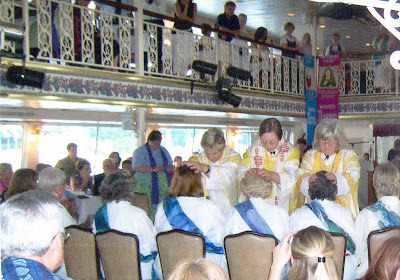 Eight women were ordained priests and four women were ordained deacons. We, the Association of Roman Catholic Women Priest celebrate their vision and courage, and honor them today! Eileen DiFranco, Olivia Doko, Joan Houk, Kathleen Kunster, Bridget Mary Meehan, Roberta Meehan, Sibyl DanaReynolds, and Kathy Vandenberg were ordained priests according to the ancient rites of ordination in the Roman Catholic Church. 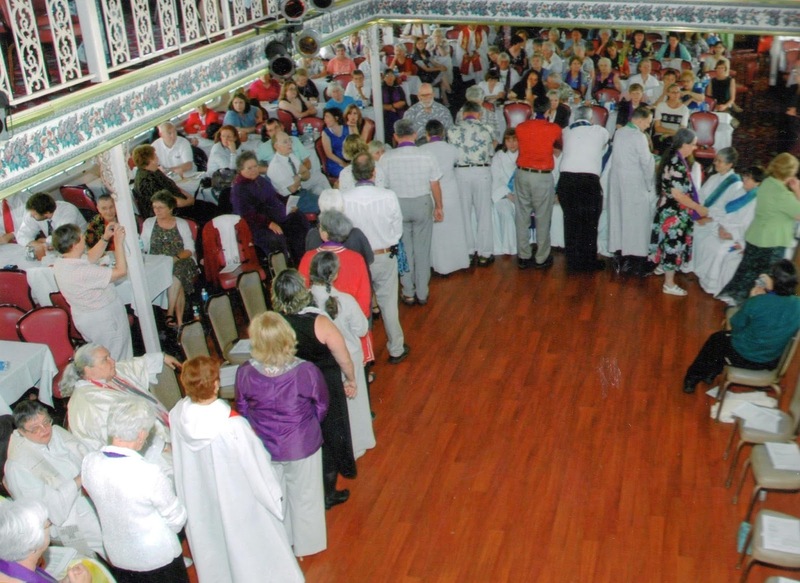 This was the first ordination of Roman Catholic women in the United States. On this same day, Cheryl Bristol, Juanita Cordero, Mary Ellen Robertson and Janice Sevre-Duszynska were ordained deacons on the Majestic. Since 2006, the ordained women have formed inclusive, small church communities that serve others where all are welcome. 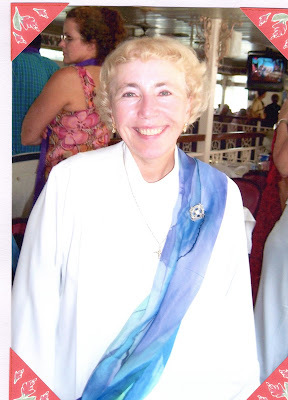 The following video was created by Peg Bowen and Mary Theresa Streck, members of ARCWP, to honor and celebrate Bridget Mary.